By their ‘indicative votes’ ye shall know them. 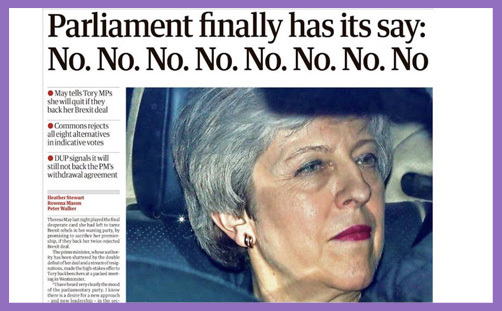 Last night MPs tried to determine what, if anything, they preferred to Theresa May’s ‘deal’, and they said ‘no’ to everything. Motion (B) ‘No deal’ got 160 with 400 against; Motion (D) ‘Common Market 2.0’ got 188 with 283 against; Motion (H) ‘EEA/EFTA’ got 65 with 377 against; Motion (J) ‘Customs union’ got 264 with 272 against; Motion (K) ‘Labour’s alternative plan’ got 237 with 307 against; Motion (L) ‘Revoke Article 50’ got 184 with 293 against; Motion (M) ‘Confirmatory public vote’ got 268 with 295 against; and Motion (O) ‘Malthouse Plan B’ got 139 with 422 against. The intention now appears to be to bring the most popular options back on Monday and possibly to rank them by a process of STV. This is likely to yield Motion J ‘Customs union’ with Motion M ‘Confirmatory public vote’. So the choice before Parliament will be Theresa May’s ‘deal’ versus a permanent customs union with the EU confirmed by a second referendum. And if the permanent customs union is rejected in that referendum, we remain in the EU. So, after more than 1,000 days since the UK voted to leave the EU, the choice before us is between remaining in the EU or leaving with a Remainer’s understanding of leaving. Or, of course, asking the EU for a much longer extension to Article 50, meaning we must hold elections to the European Parliament (and, of course, appoint a Commissioner), and the whole thing drags on for another five years. You can imagine the scorn he received for tweeting this. It’s easy to tell the Archbishop of Canterbury how badly he’s doing, easy to abuse and threaten. But he is tasked with the cure of souls and (and the soul of the nation), and deserves respect. He seems to have reverted to his previous optimistic vision for Brexit – one which offers “a wide and liberal future” – rather than the ubiquitous episcopal pessimism of folly and betrayal. The imperative now, he says, is to respect the vote of the people, which was to leave the EU. His decisive intervention has gone down well with the Daily Mail, and the Express, if not with the Bishop of Leeds. But a permanent customs union with the EU isn’t leaving the EU, not least because there is only one customs union on offer from the EU, and that is the customs union we are already in, which prevents unilateral trade deals. Leaving one binding customs treaty for another is the antithesis of taking back control, for we would still have no independent UK trade policy. There could be no preferential agreement with (say) the USA or Commonwealth countries, and all tariffs would be set to suit the EU. Indeed, the customs union is by far the worst aspect of EU membership because it warps the market and hinders free trade with the rest of the world, as economist Ryan Bourne has explained eloquently. It is really rather astonishing how many MPs don’t actually understand the difference between the Single Market and the Customs Union, and how few have any apprehension of the differences between the trade arrangements which the EU has with Turkey (in the CU) and Norway or Switzerland (not in the CU). It is even more astonishing how many clergy pontificate about it without even a glance at Economics made Simple. What is our liberty for if not to govern ourselves? Like all of you I have wrestled with my conscience about what to do. I could tear this place down and bulldoze it into the river. These fools and knaves and cowards are voting on things they don’t even understand. We’ve been put in this place by people whose addiction to power without responsibility has led them to put the choice of No Brexit or this deal. I may yet resign the whip than be part of this. If this ‘deal’ is the lesser evil (ie the option which most honours the vote to leave the EU and the one most likely to unite the country), it is incumbent on politicians to choose it. That doesn’t diminish its inherent atrociousness, but we live in an unfriendly world and politics and party now are not what politics and party were formerly. There is no fidelity to philosophy or respect for democracy, and even less is there reverence for the spiritual society. The “fools and knaves and cowards” prefer casuistry to conscience, and expedience over conviction. All external revelation is subject to internal consciousness, and their private halos of goodness are worn like toupées of signalled virtue concealing bald pates of delinquency and malfeasance. You may not agree with the Archbishop of Canterbury, and you may abhor being cornered into the Prime Minister’s ‘deal’, but if the alternative is civil strife and revolution, it is for Christians to work for peace in a home of freedom – incrementally, organically, and in accordance with the traditions and customs which have served us well for centuries. ‘Sufficient unto the day is the evil thereof.‘ At least the ‘Withdrawal Agreement’ extricates us from the EU legally: it will be for Theresa May’s successor to run with perseverance the next part of the relay.